It’s been nearly five years since any would-be undertaker has graced its halls. 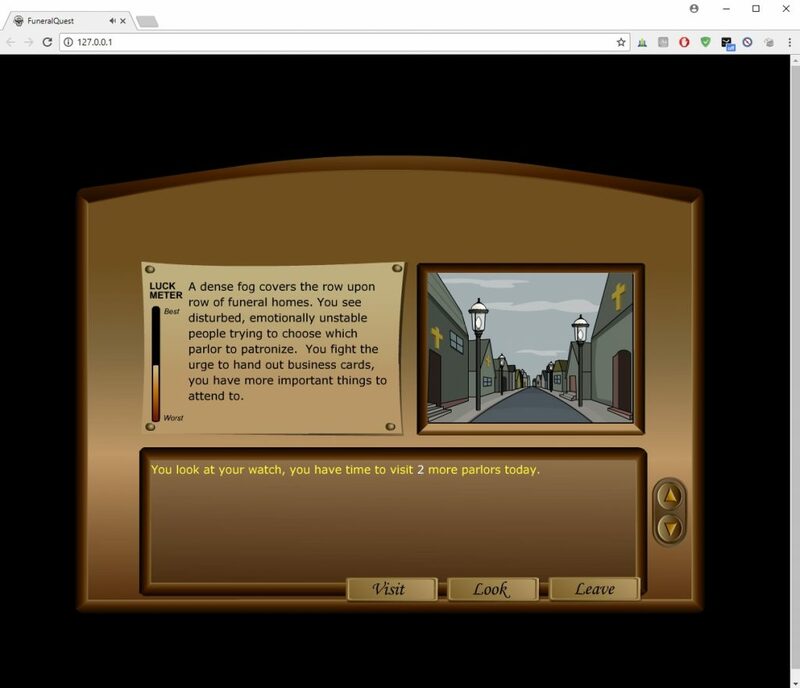 In 2013 the old XP machine that was running the only FQ server in the world was decommissioned – and that was that, a game like no other silently departed with nary a single youtube video left in remembrance. I wrote it in 2001 it was to see if a BBS door-like financial structure could make sense in a modern web environment. I charged $99 (I think?) a year for the enterprising admin (or, a SysOp if you prefer…) to run their own FQ server which they could customize. It was free for players. message|"It's like a stabbing ... but different," comments the coroner's office. give_random|`wThe phone rings - It's Golden Oaks Retirement Home.\n\n`$"We've got some bodies for you..."
add_log|`7FUNERAL HOME CHOSEN\n`^Golden Oaks Retirement Home has announced that *NAME* from *HOME* will be hosting services for the recently departed. Did the grand experiment work? Well, no. In retrospect it’s pretty obvious why: why would anyone need to run their own server when calling areas and zip codes no longer exist? Why would anyone care that they could make a customized version of something so niche as a “funeral parlor simulator”? For some reason I made the server contain a complete HTTP server and run under Windows. Makes it really easy to setup and use but .. yeah, not how I’d do it today. Well, I finally found the time so here it is. If anybody actually sets up a working public game of FQ let me know and I’ll help get the word out. Check the FQ forums if you have problems or questions. 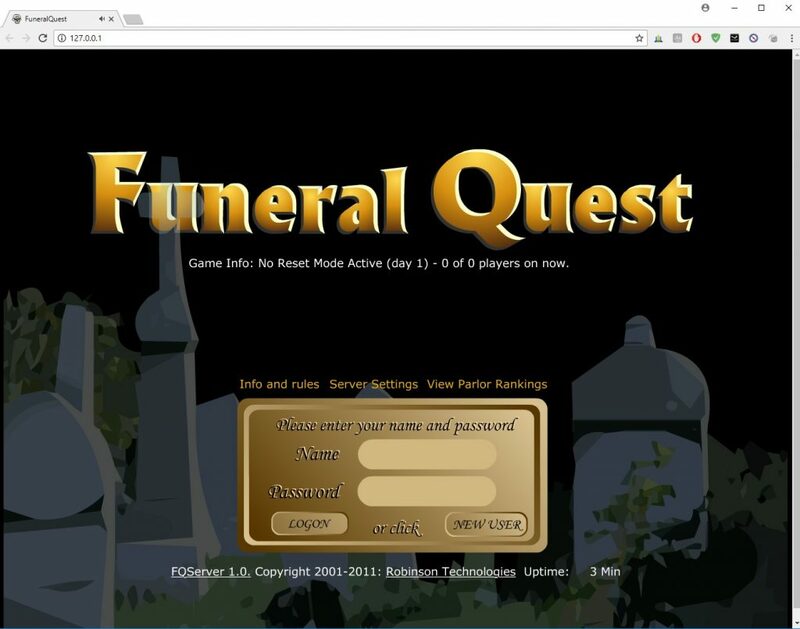 This is a special version of the Funeral Quest server that has been modified to no longer need a license, it's the "full version" so to speak. It can be used to play the game locally or run a real server so hundreds of people can play together. 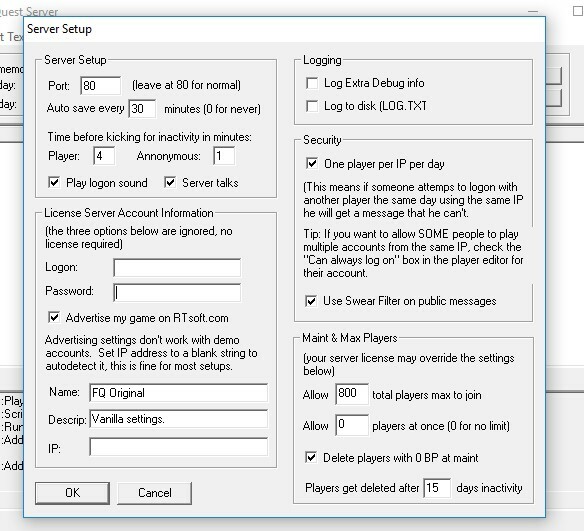 * Run FQServer/fqserver.exe to start the server. Note that when minimized it runs as a tray app, so if it disappeared, check your system tray. Big thanks to FQ fans and sorry I didn't release this sooner. If you actually get it running and want the full C++ source code in all its MSVC2005 MFC glory, let me know, can probably do that. It takes skill to read your customers. Training in psychology makes more information about their mood and feelings available. Maybe now FQ can truly rest in peace. A 30-day Funeral Quest tourney begins .. RIGHT NOW! This entry was posted in Development/RTsoft, LORD/BBS on March 29, 2018 by Seth. That’s awesome! I remember having lots of fun playing on the rtsoft Funeral Quest server way back when. 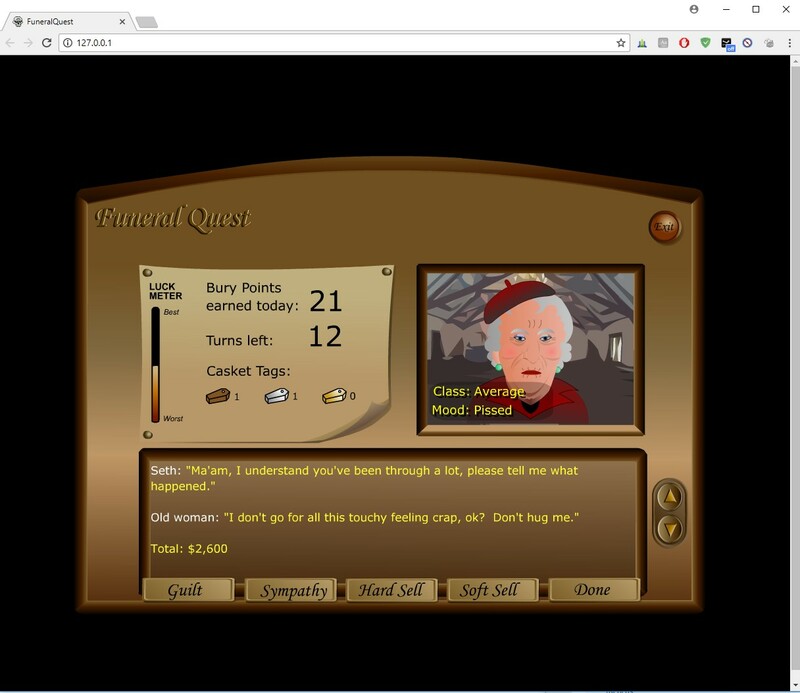 Thanks Dan, I’ve added your links to the FQ page over at http://rtsoft.com/pages/funeral_quest.php ! I was one of your payed customers. My friends enjoyed the hell out of this game. Thanks again Seth! Lovely news! Glad that has seen the light of day once more. I was a huge fan of this game!! I aqquired an HP server from a eye doctor franchise where i live. The only thing running on it is Funeral quest.. 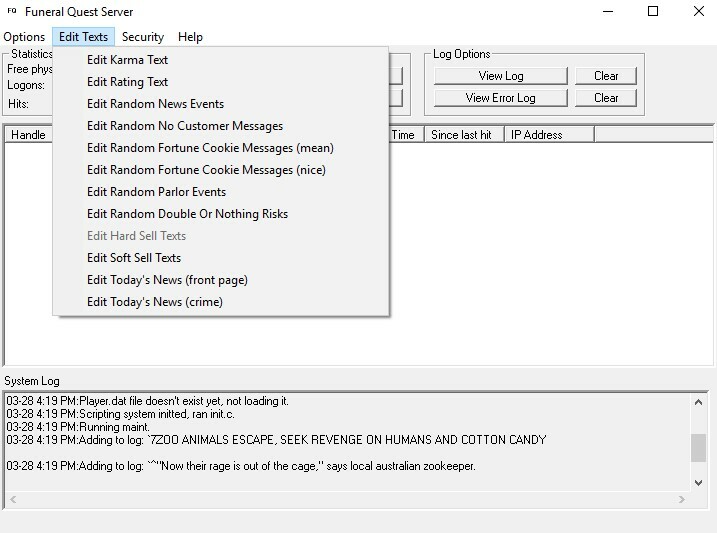 I also have it hooked up to a cradle point just incase of ISP shut down.. Its on seths FQ page under neils server.. It has a subdomain right now.. Im trying to get the word out but not much happening yet.. Altho of things pick up im willing to buy a domain.